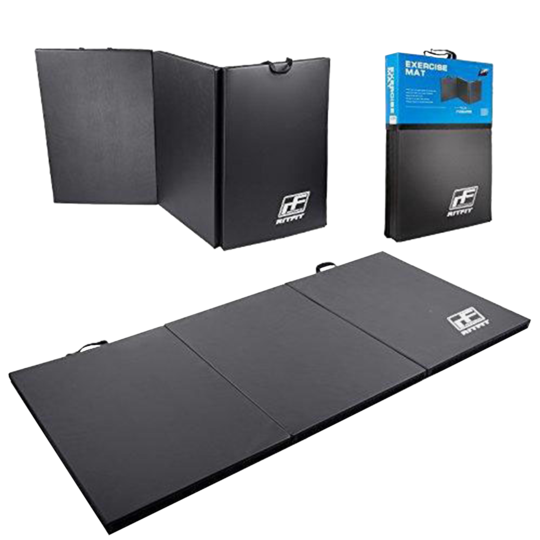 Tri-Fold Thick Gym Exercise Mat with Rough Handle The Ritfit Exercise mat gives you various types of sports that can be practiced anywhere and anytime. RitFit Triple-fold folding for a triple foot exercise mat Exercise mat You are eager to do different kinds of sports anywhere, anytime Ritfit Exercise mat gives you a variety of sports that can be played anywhere, at any time. Whether you’re at home, in the gym, or outdoors, do not let a little hard stand in the way of your fitness routine. Features in a Triple Training Exercise Pillow Solid and thick: tri The density and density are exclusive and dense and provide a firm grip that provides maximum support and comfort. Hold lengthens longer with more stability. PU Leather Cover Soft and anti-sweat, non-slip, non-toxic, easy to clean, provides excellent and safer support for wood panels, exercise, and even as a baby mat. Unique design: Velcro straps On each mat end (3 * 6), it can be connected to additional mats. Practical fitness exercises and trunk muscle exercises. Pilates offers multiple exercises to strengthen the muscles of the arms, shoulders and legs. It is lightweight, portable and detachable for easy storage.